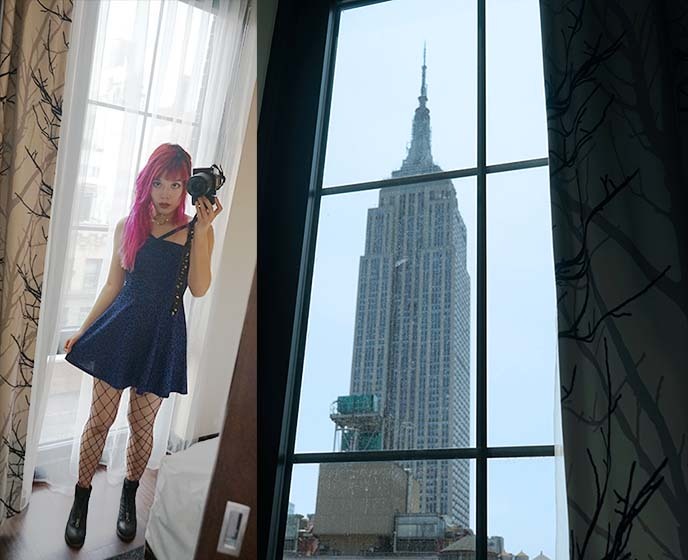 New York Goth travel guide! 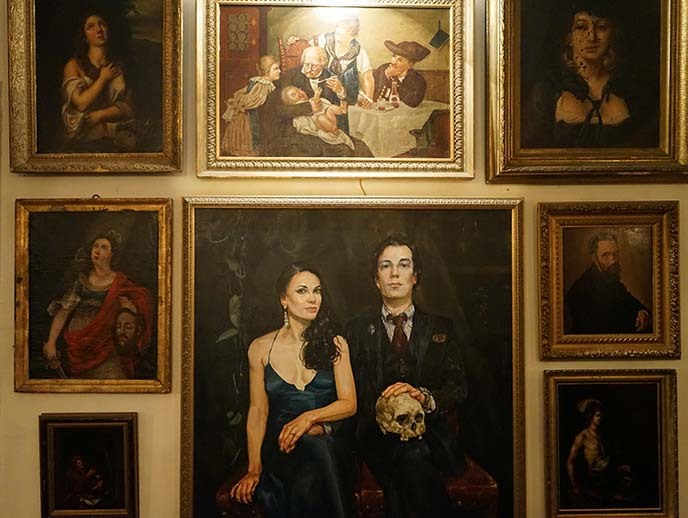 Ryan & Regina Cohn’s Oddities Flea Market, House of Wax bar, Archer Hotel NYC. New York, New York. It’s always good to be back. A lot has changed since I lived here (it seems I’m in reminiscence mode these days). NYC has become a different world than the one I knew: there’s now WiFi in the subways; everyone relies on smartphones for getting around, and takes Ubers to parties in Brooklyn. Meanwhile, I can recall the days of flip-phones and the Korova Milk Bar! Still, this remains “Gotham City.” I was delighted to meet up with friends old and new, and check out NY’s latest Goth / bizarre bars, club nights and more. 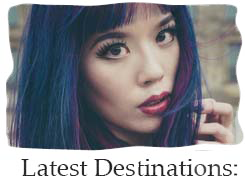 … as well as Stella Rose’s pop up fashion boutique, Gothic nightlife, and tips for alternative travelers! 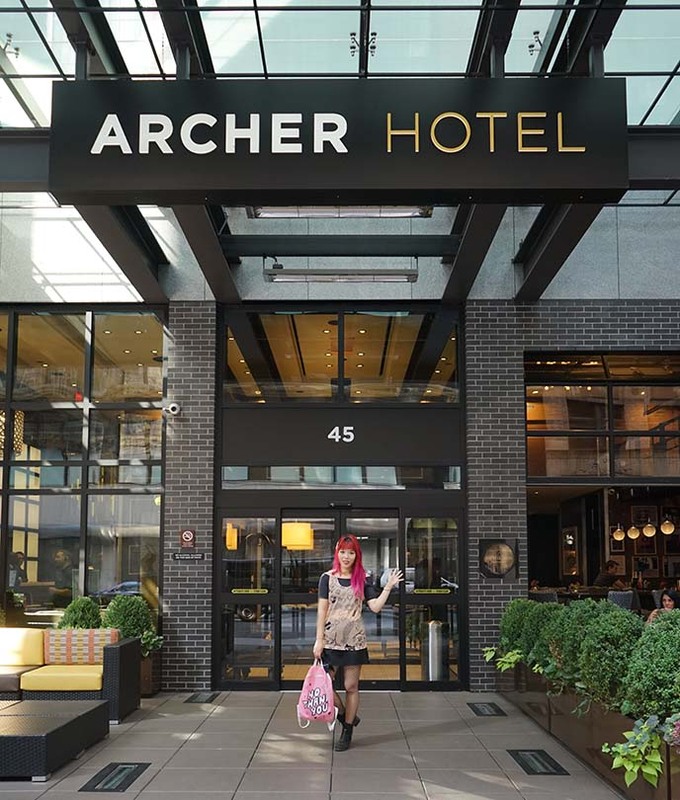 This time, I stayed at Archer Hotel NYC right in midtown Manhattan. If you’re only in the city for a few days and love boutique design hotels, then this is the place for you. While I was in New York, Ryan Matthew Cohn and Regina Marie Cohn invited me to visit them in Brooklyn. 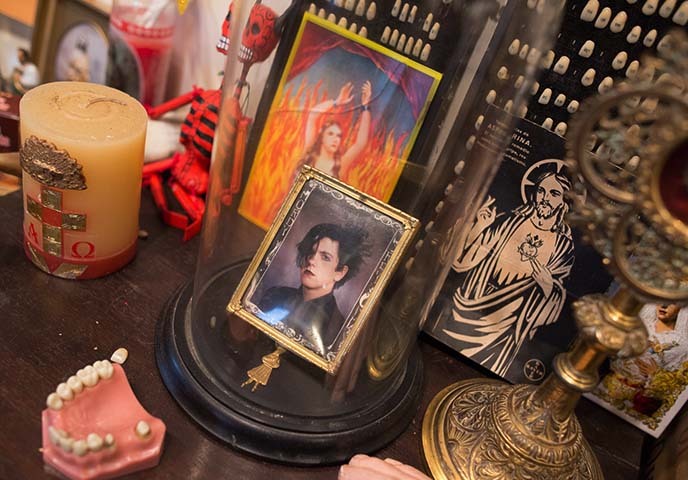 As you can see in these images, their home is a treasure trove of morbid curiosities! 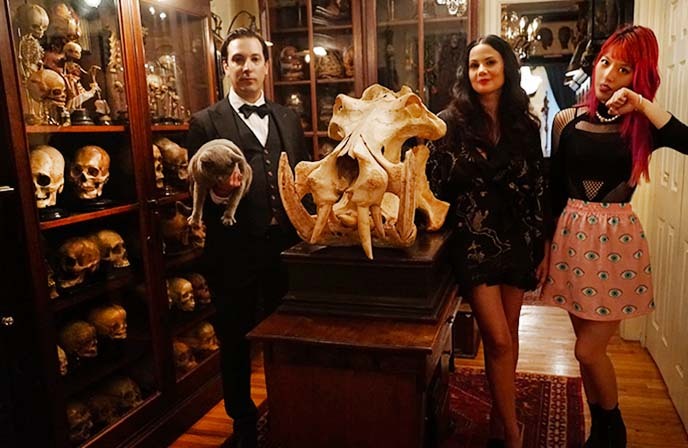 You might recall that I was a guest on Oddities; we’ve kept in touch since then, as we obviously share a love of all things dark and deathly. Ryan and his lovely wife Regina currently work together in this fascinating field. 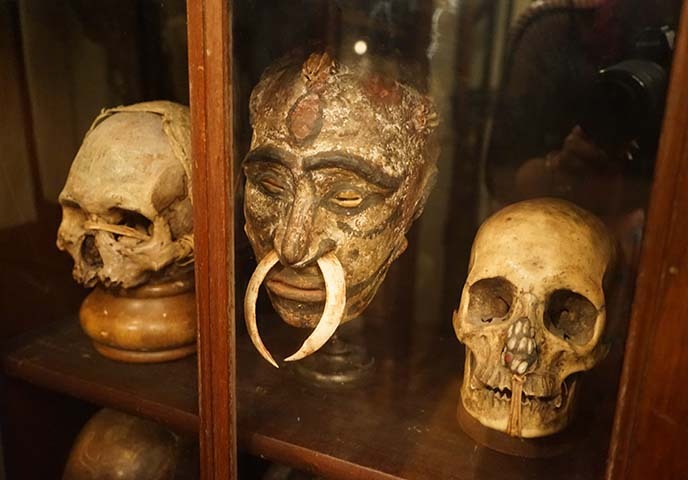 They source, restore and sell unique osteological artifacts and other curiosities, as well as curate, lecture and educate on these subjects. 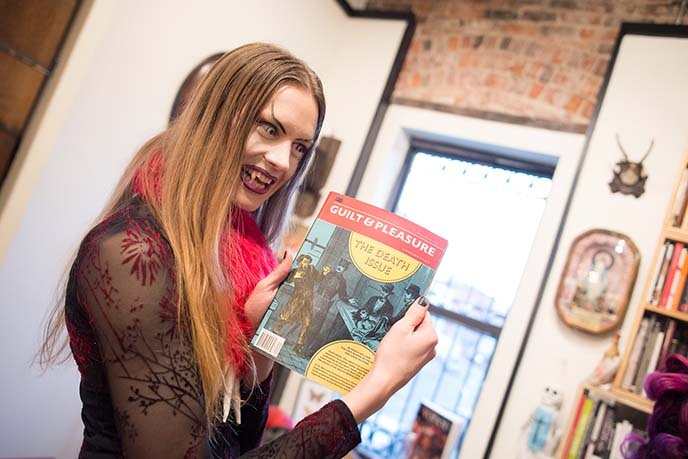 Exciting news: Ryan and Regina recently launched an Oddities Flea Market, which brings together vendors of all things peculiar! Mike Zohn and Evan Michelson of Obscura Antiques will be two of the many participants. Their first event was such a success that they’re now hosting a two-day market on September 30th and October 1st –– NY friends, you must come check this out. Ryan and Regina have brought together only the best purveyors to take part in the Oddities Market. 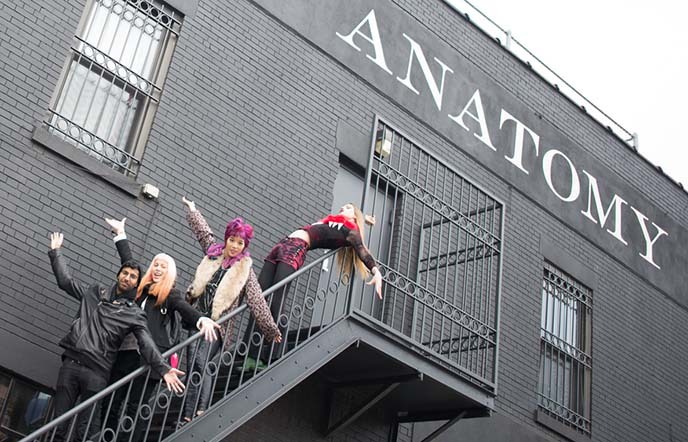 In a single location (Brooklyn Bazaar), guests can browse and buy anatomical wonders, taxidermy, Gothic jewelry, bizarre art… you get the picture. These photos of Ryan and Regina’s home give you a sense of what to expect. 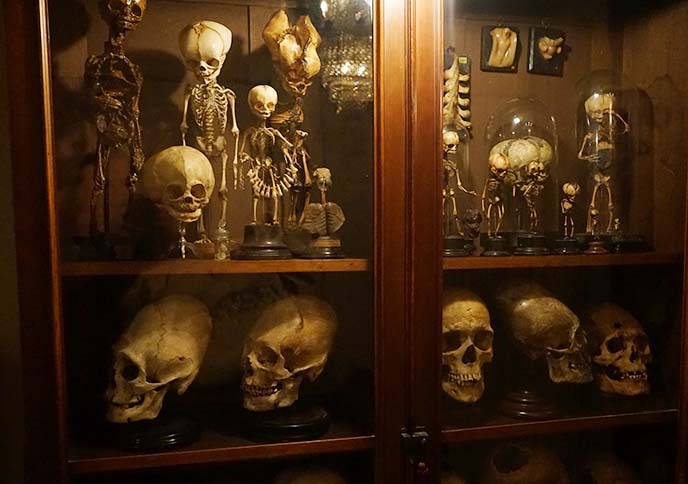 I spy an Anatomical Venus, medical preparations in jars, shrunken heads, and skulls galore… I could spend hours browsing their personal collections, which are enough to fill a museum! 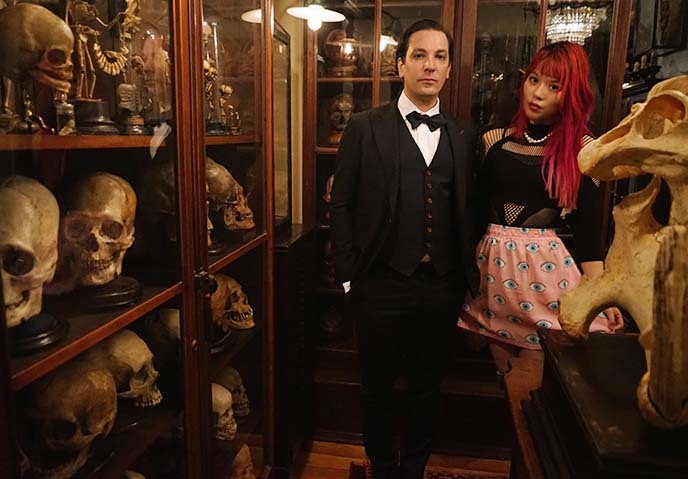 Ryan and Regina are constantly traveling in search of “morbid anatomy” objects, which will be available for sale at the market. 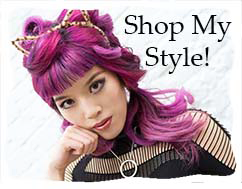 Plus, you can browse dozens of tables from Blood Milk, Amber Maykut, Goldengrove Jewelry, Adam Wallacavage, Meagan Meli and others. Come join Ryan Matthew Cohn, Regina Marie Cohn and friends! When: September 30th and October 1st, from 12PM to 6PM. Ticketing: VIP pre-sale tickets are available for purchase through Atlas Obscura (act fast, Saturday is already sold out). These tickets will gain you entry at 11 am with full access to all 43 sales tables. Or, just show up for general admission at the door, which is only $3. 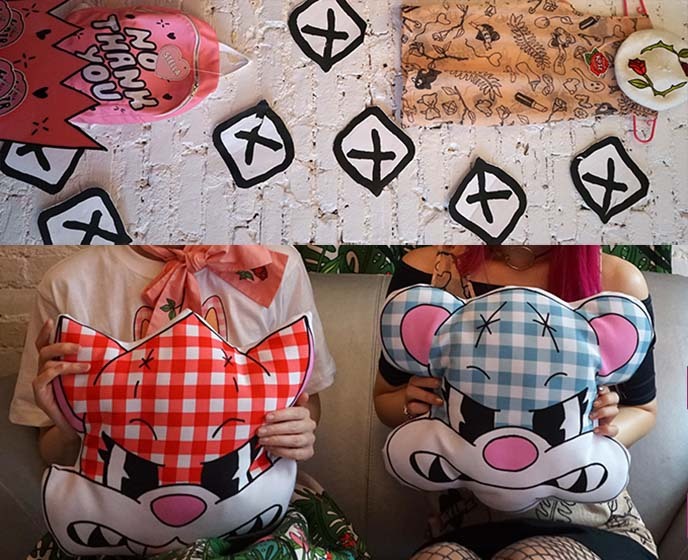 There’s more info on the Oddities Market RSVP page. Be sure to let your New York friends know, and say hello to Regina and Ryan for me! 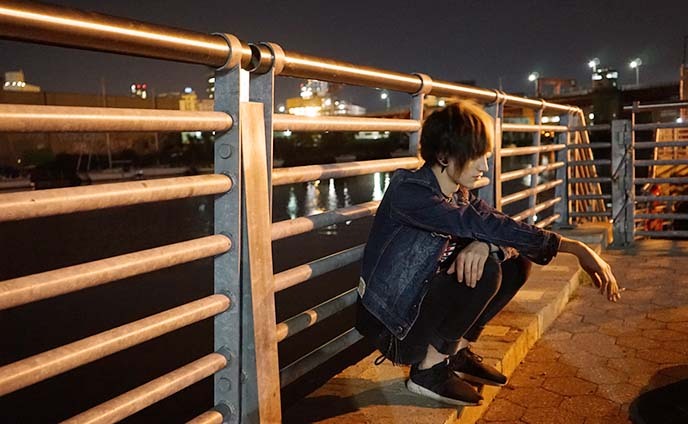 I wish I could be there, but we’ll get together again very soon. 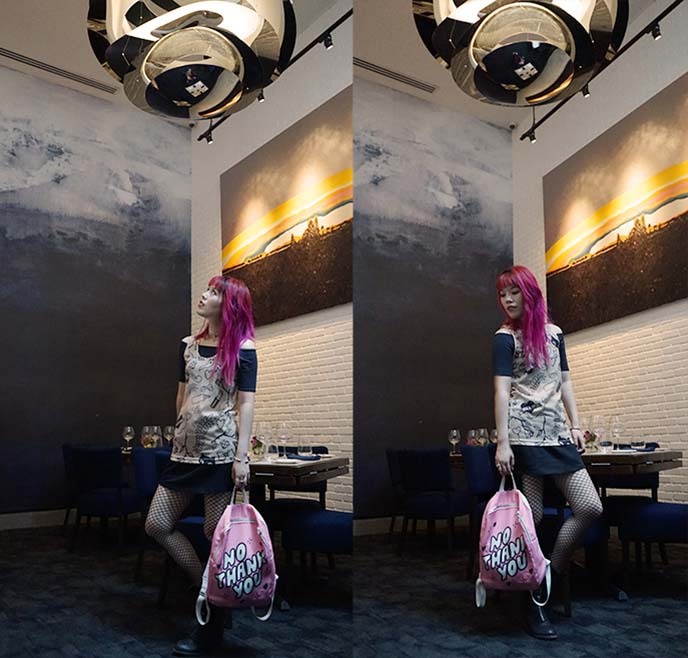 … but first, an outfit change back at Archer Hotel New York! The midtown location was near tons of subway stations, which made it easy for me to get to appointments in different boroughs. (Address: 45 W 38th St, between 5th and 6th Ave). I love clean design, and felt right at home amidst the modern, industrial brick-and-glass decor. … but when you’re in the Big Apple, you’ve got to explore! With Archer Hotel NY’s central location, you can walk to lots of local spots. I confess I made several trips to Joe’s Pizza, which has a new Times Square location for its classic New York slices. Right in the hotel lobby, you can enjoy a memorable dinner at Charlie Palmer Steak. 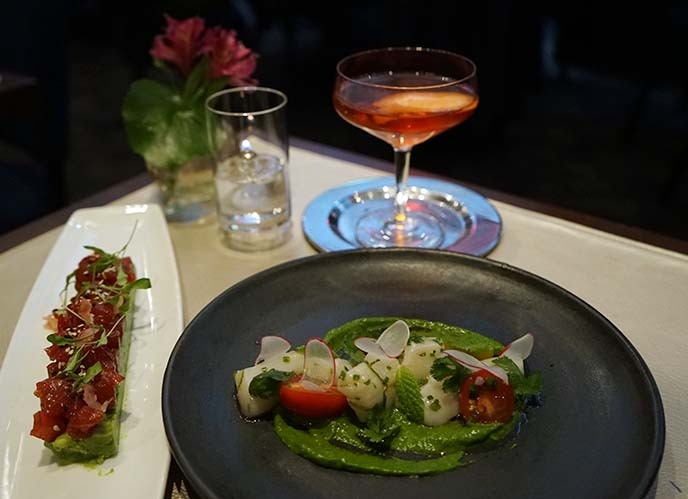 The NY steakhouse reflects chef Palmer’s bold, progressive American cuisine, which draws upon seasonal / local flavors from surrounding waterways and farms. Next came a perfectly seared, melt in your mouth filet mignon. It was hard to choose from the many spectacular sides available (truffle potatoes, asparagus) and sauces (the house CP sauce is recommended). Finally, dessert: creme brulee with black currant and Tahitian vanilla creme, with passionfruit and vanilla ice cream. 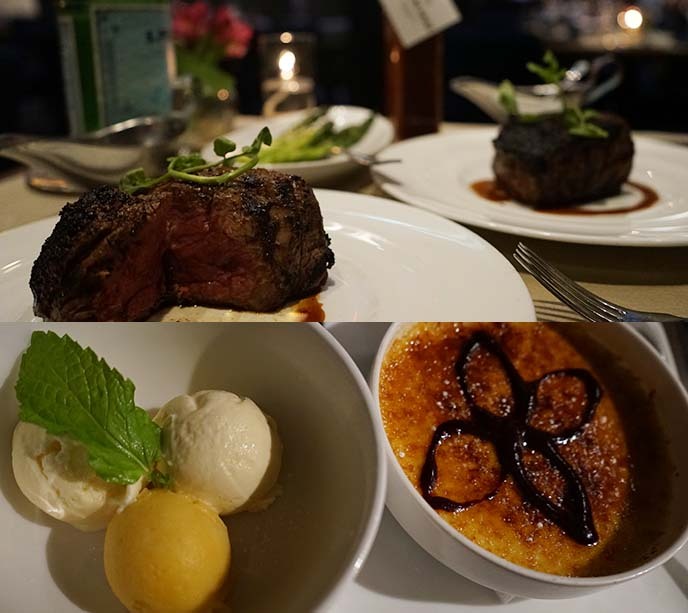 For a special celebratory meal with excellent service, Charlie Palmer Steak delivers big-time. A stay at Archer Hotel NY isn’t complete without a cocktail at their Spyglass Rooftop Bar. 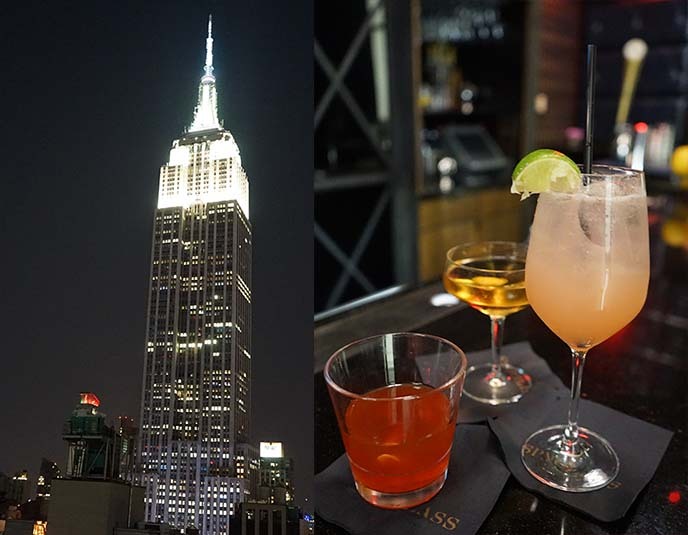 On the 22nd floor, you can take in a panoramic view of the Empire State and Chrysler Building, while sipping a crafted cocktail. The Spyglass bar also has a classic Manhattan happy hour; the “Archer Palmer” with black tea-infused gin and lemon fit with the retro vibe. 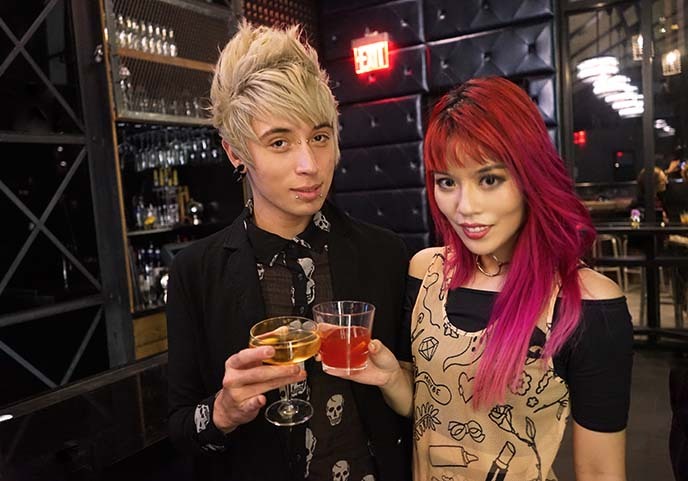 Cheers to Archer Hotel New York for a fantastic stay! 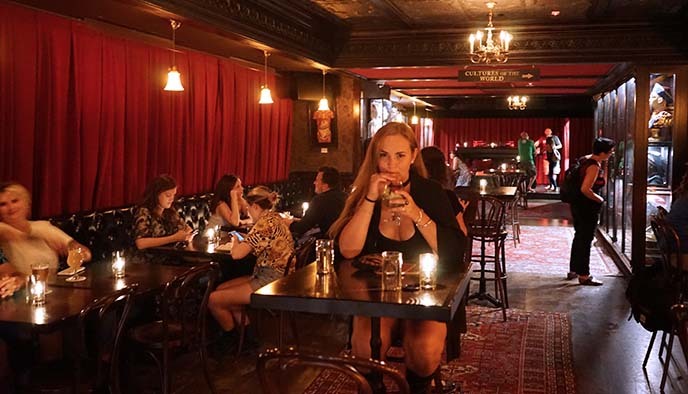 I enjoyed more outstanding cocktails at The House of Wax Bar in Brooklyn, with my friend Lily Streeter of Alex Streeter Jewelry. 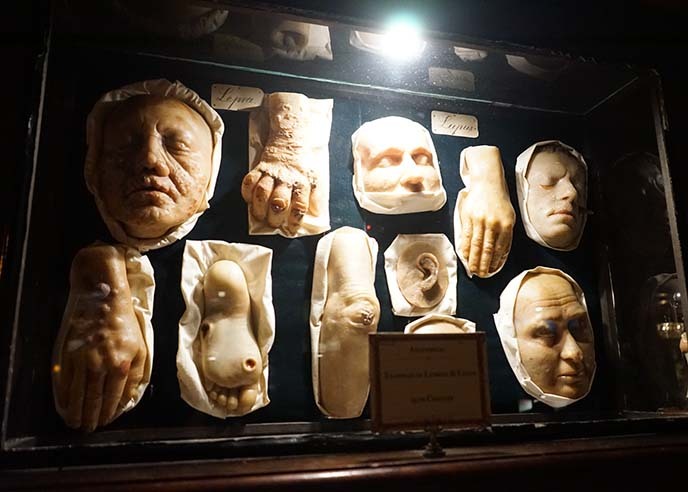 As soon as we arrived at the entrance, which is lined with 19th century death masks, we knew we were in for an adventure. 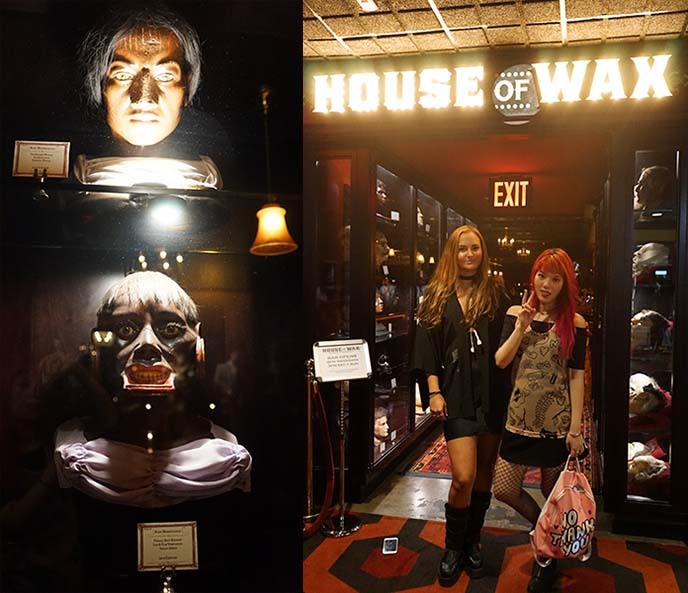 House of Wax is a little hard to find, so listen up: it’s inside the Alamo Drafthouse movie complex on the fourth floor, in the same building as Dekalb Market Hall and Trader Joe’s. (Address: 445 Albee Square). Lily was wearing the Angel Heart pentagram ring, one of Alex Streeter’s most iconic designs. 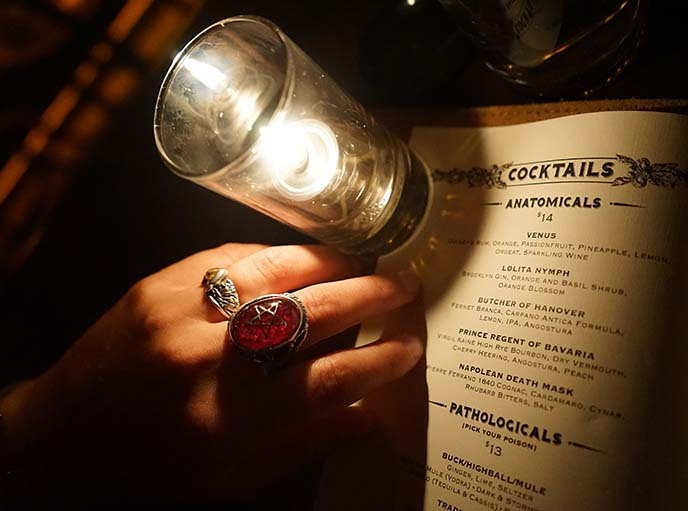 We examined the cocktail list by candlelight: they drew upon 19th century ingredients, and had names such as Butcher of Hanover, and Napoleon Death Mask (made with Pierre Ferrand 1840 cognac, Cardamaro, Cynar, rhubarb bitters.) Talk about mixology meeting the macabre! I’ve been to a lot of theme bars worldwide, but this was one of the most outstanding. 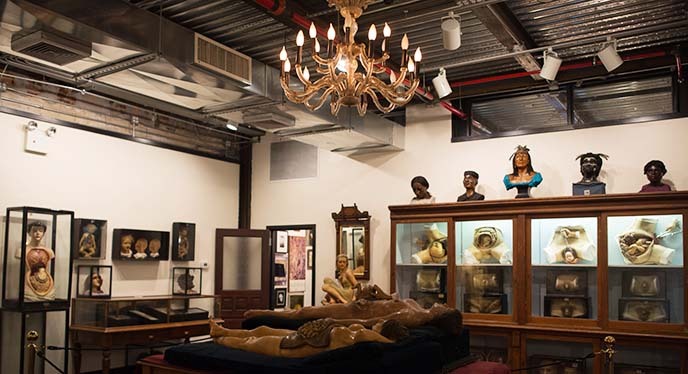 House of Wax features a permanent collection of 19th century wax moulages, curated by Ryan Matthew Cohn. 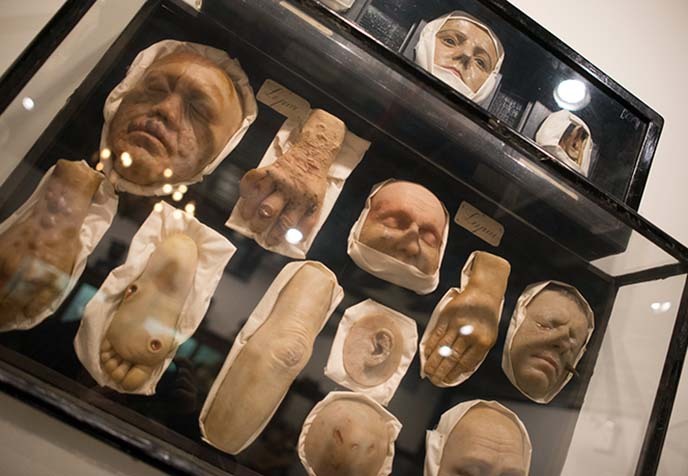 He sourced over a hundred medical wax models from Germany, which were once used to demonstrate surgical procedures and diseases. 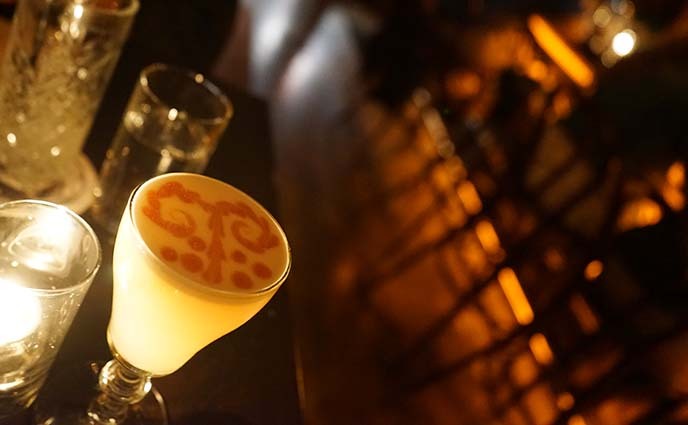 Lily and I loved trying the Anatomical and Pathological cocktails, which were perfectly balanced and creatively concocted with old-time ingredients. We snacked on small bites (the menu includes pretzels with cheese, edamame hummus, flatbreads and cheese boards). Between rounds, we walked around and admired the glass display cases of wax figures, eerily lit by chandeliers. Behind the bar, there were dozens of New York beers on tap. I’m an absinthe aficionado though, and couldn’t resist this cocktail with an egg white foam. Without doubt, I’ll be coming back to The House of Wax Bar with friends. 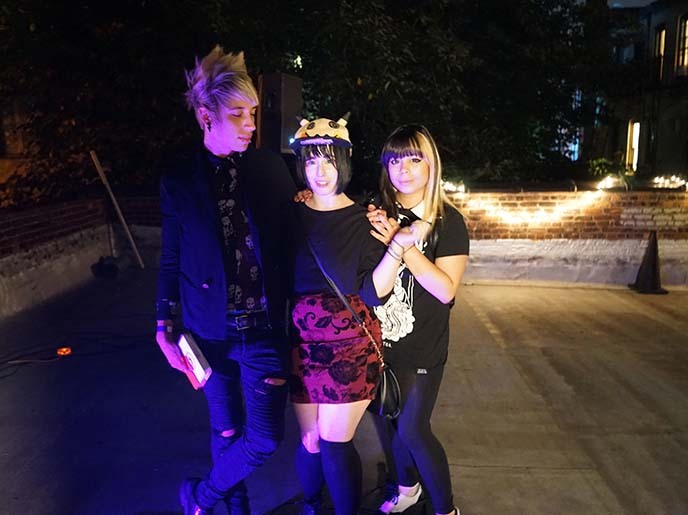 I couldn’t think of a better place in NY to have a Gothic gathering. Now, time for some nightcrawling. 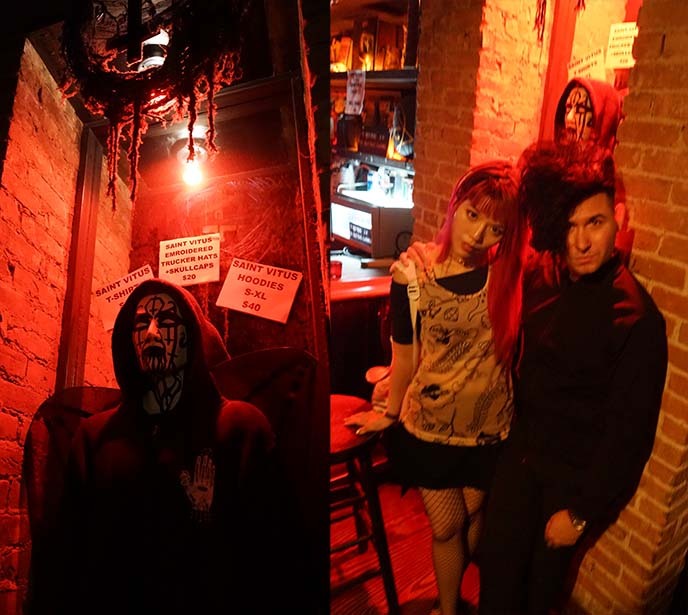 I’ve written about Goth nights in NYC over the years; the party scene is constantly changing. 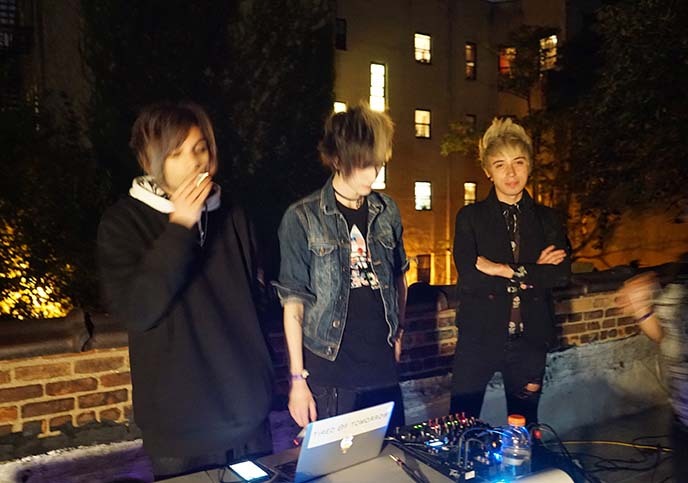 Right now, a lot of the best Gothic / underground / alternative parties are in Brooklyn. New York’s nightlife is always evolving, and it’s not a bad thing. Zachary told me that St Vitus now has a brilliant synthwave party, called Night.Wav. As a retrowave addict, I’d love to check it out (as well as the other outrun events that are starting to bloom worldwide, like San Francisco’s Turbo Drive). 4am on the waterfront. Late, decadent, alternative nights in New York with friends… that is something that will never grow old. 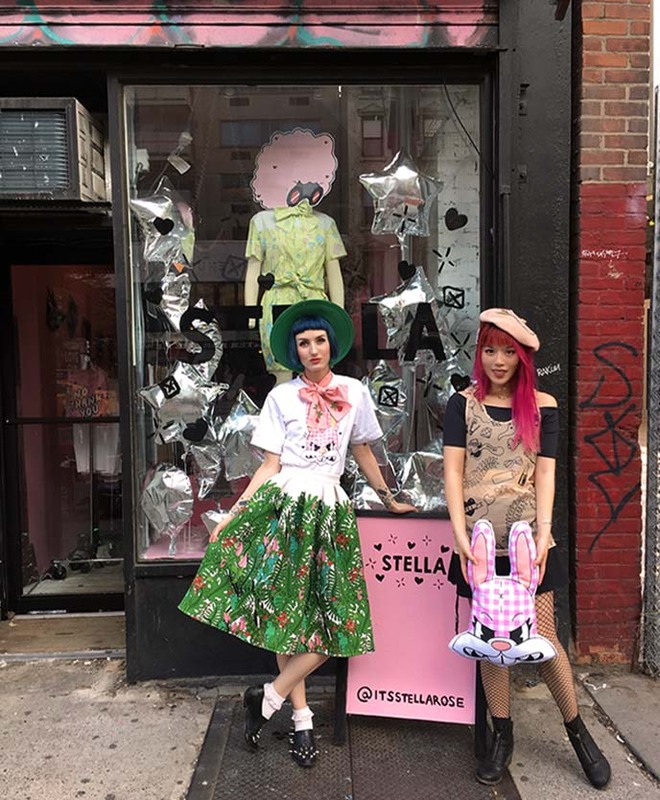 Last but certainly not least, I stopped by the pop-up shop of my friend Stella Rose. She and I were bloggers way back in the day, and I’ve watched her grow her spirited clothing line to the success it is today. 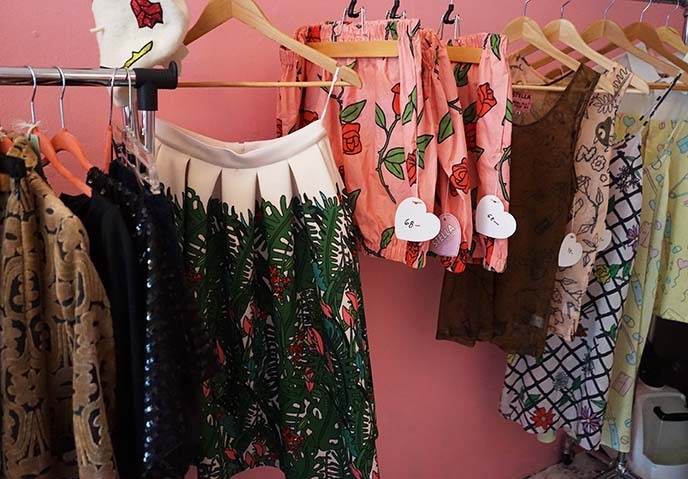 The boutique was filled with her charming and cheeky designs, from her It’s Stella Rose fashion collection. 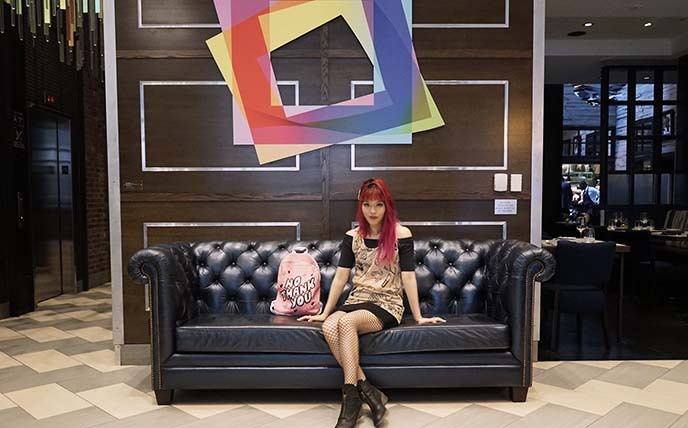 I have the “No Thank You” pink backpack and sheer tank top above, which she made in collaboration with Print All Over Me. 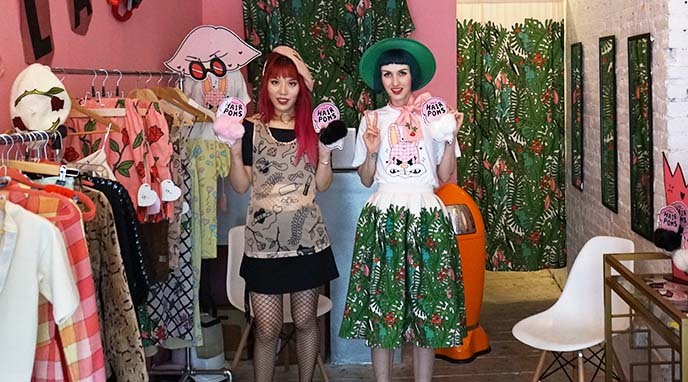 Isn’t the Stella Rose boutique fabulously decorated? I tried on her handmade rose beret, and held on to her fuzzy pom-pom hair ties that come in different colors. 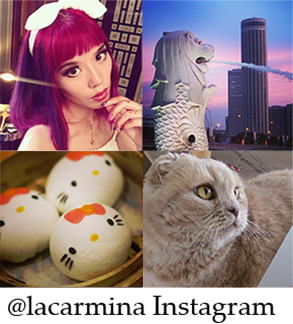 Angry animals, tropical skirts, ghosts… the cuteness meets attitude is distinctively Stella. 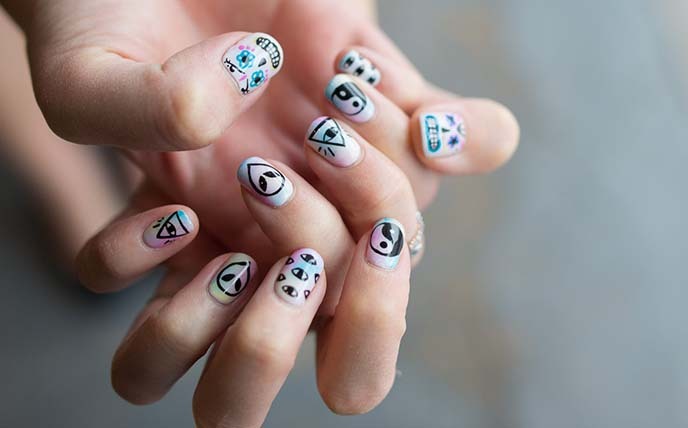 You can find these designs and more on her Stella Rose website and Facebook. I ended my trip with a “Goth latte.” I heard that Round K Cafe served a matte black latte, blackened with organic coconut ash, almond paste and coconut cream. A drink for dark, lost souls. 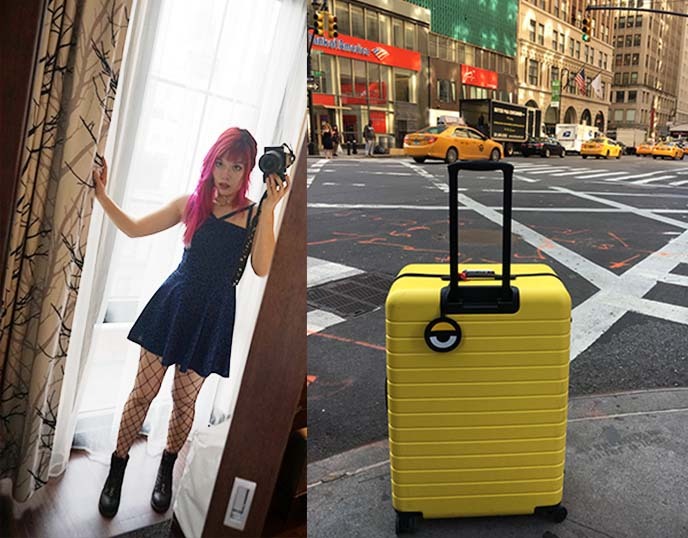 Time to pack up my Minions x Away luggage, until my next trip to NYC… I’ll be back soon, as always. 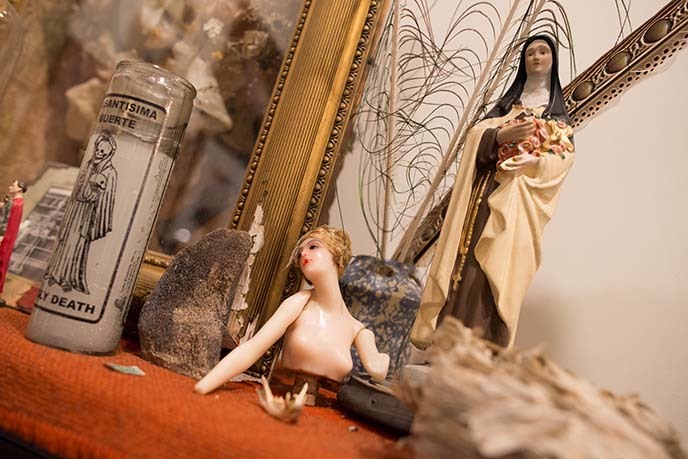 Did you enjoy this peek into Ryan Matthew Cohn’s world, and Oddities Market? 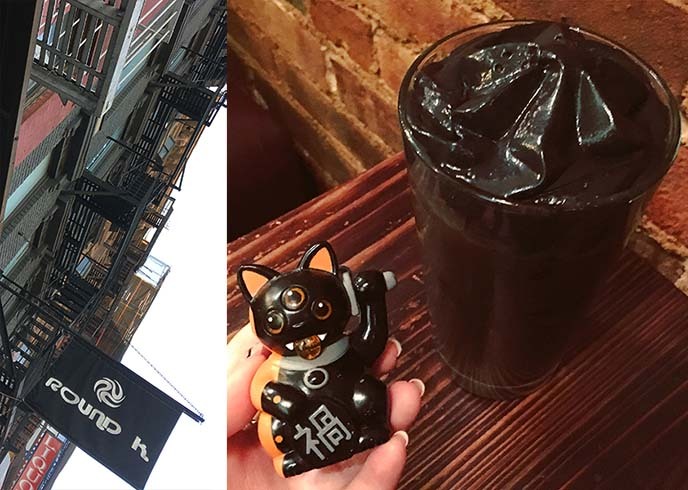 If you’re looking for more New York City Goth travel tips, click here – this blog has a decade’s worth of stories from the city! 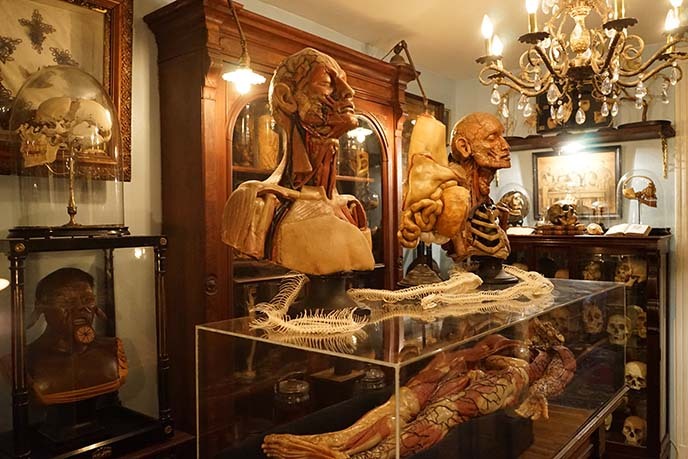 Visiting the Morbid Anatomy Museum in Brooklyn: Medical anatomy wax statues & Library of Oddities. If you’re a fan of Oddities (the Discovery / Science TV show that I appeared in) — then I’m sure you are dying (get it?) 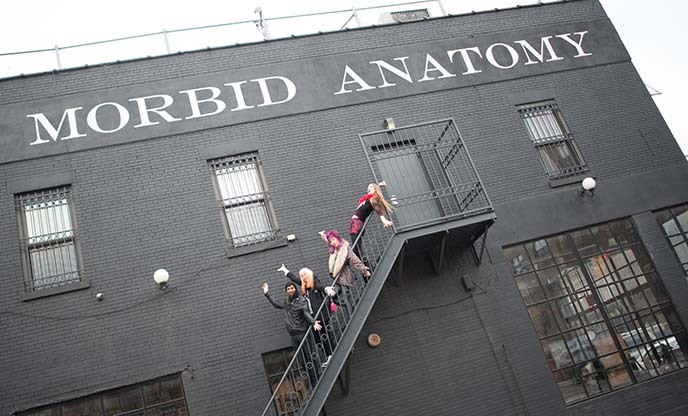 to visit the Morbid Anatomy Museum in New York! The two-floor museum has both permanent and temporary exhibitions on display. 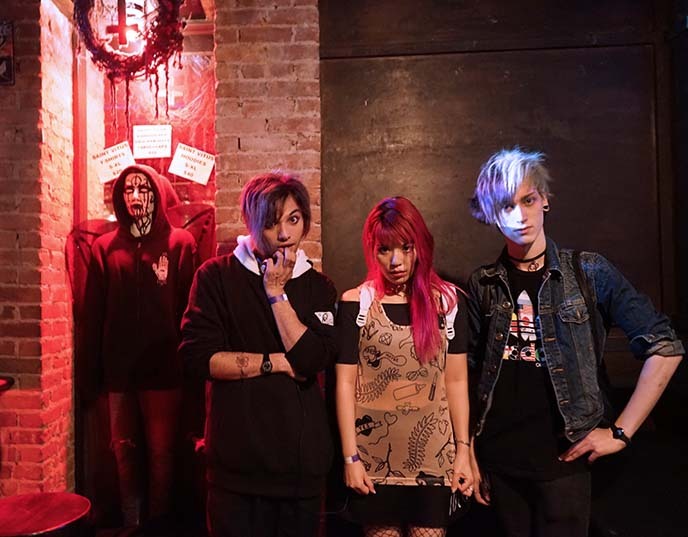 Yukiro, Jenny, Hiten and I couldn’t resist lining up on the staircase for this dramatic shot! 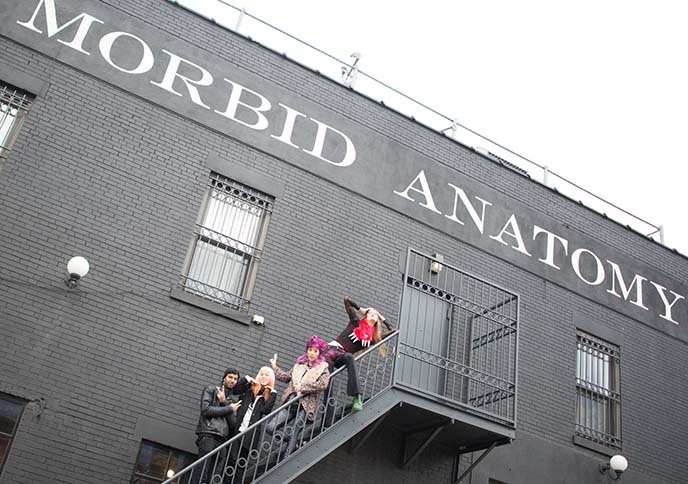 UPDATE: the Morbid Anatomy Museum has closed, RIP. Check their website for any updates. The exhibits and library are open from 12-6pm, every day except Tuesday. Admission fees, tickets and event announcements are found on their site. Yukiro and I began our visit with a snack and coffee at the museum cafe. So many curiosities to see in the lower level gift shop. 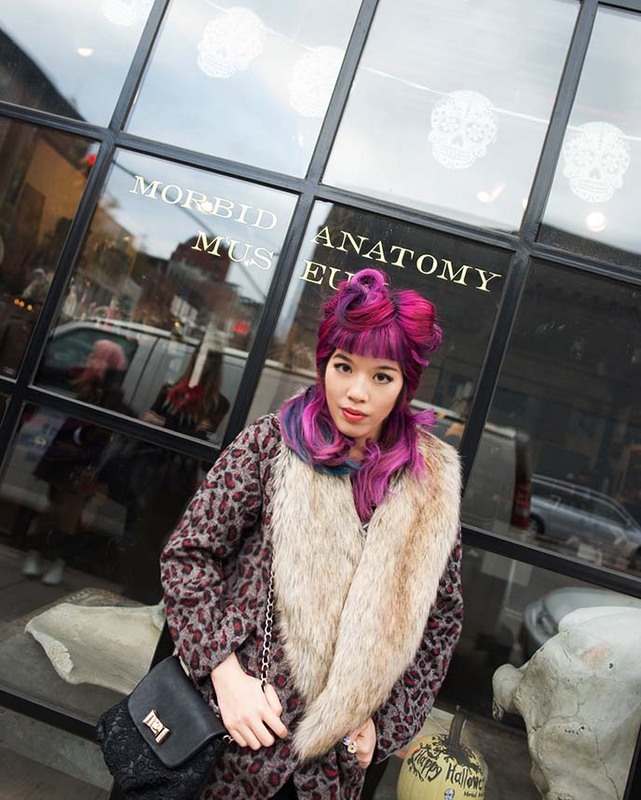 (I’m wearing a faux fur coat from Alice’s Pig, an urban vintage-inspired clothing line from London). 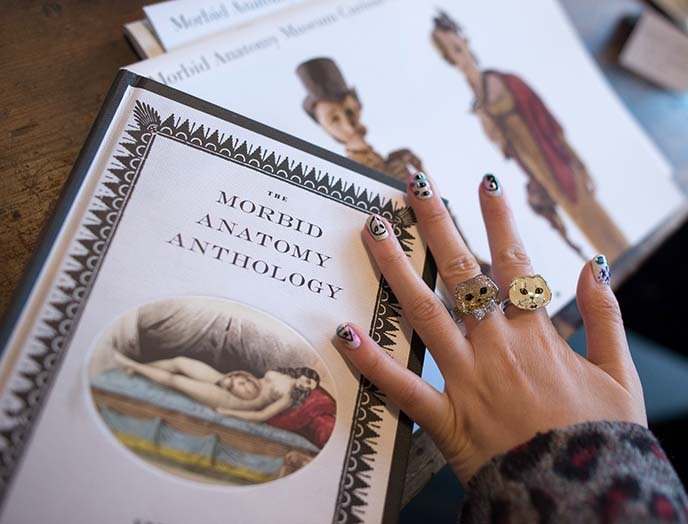 I was enthralled by the Morbid Anatomy Anthology (edited by Joanna Ebenstein), a 500 page tome with lavish full color illustrations. I flipped through essays about demonic children and corpses. (On a cuter note, my Scottish Fold rings are by PuraBobo. The designer custom-made them to look like my round yellow cat). Yukiro looks like one of the gift store curiosities, with undead makeup and a monster-claw scarf. 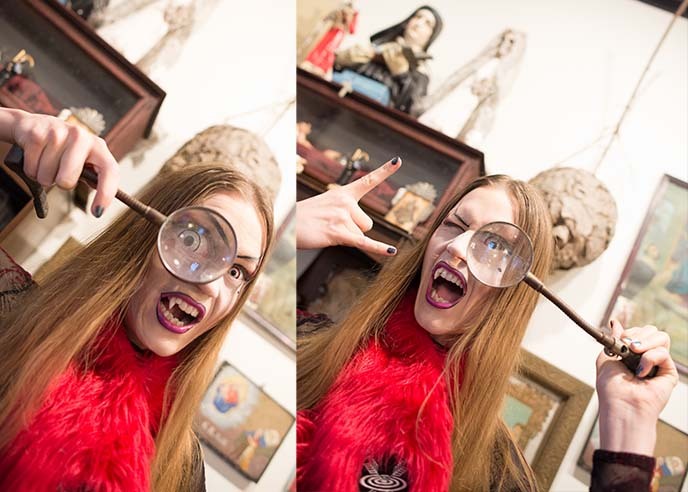 Curiosities lurked all around the Morbid Anatomy cafe and shop. 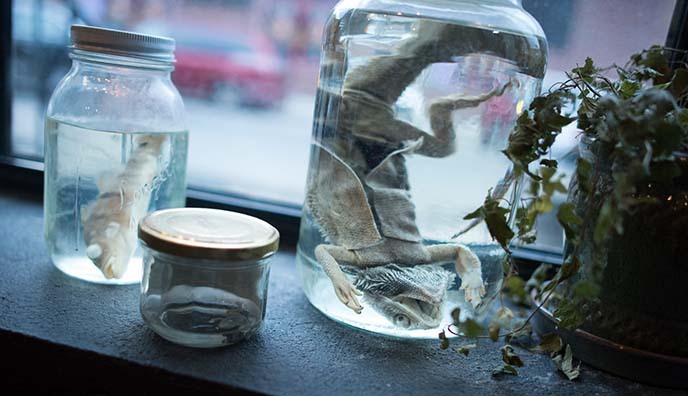 We spotted taxidermy mice in a Ferris wheel, and mysterious creatures preserved in jars. 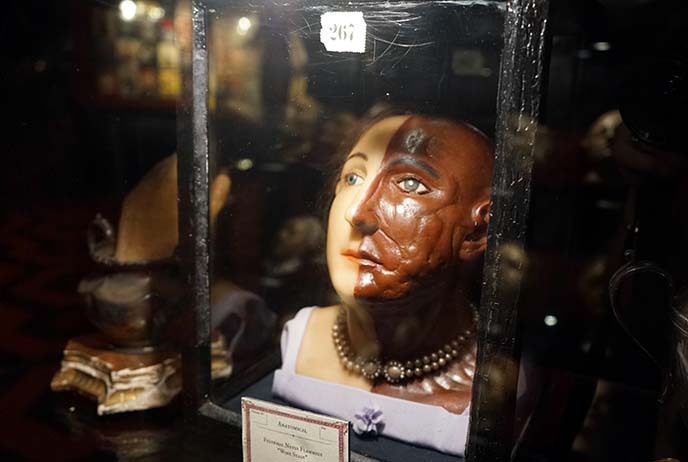 The Morbid Anatomy project is supported by scholars worldwide. Many have lent out their private collections, and anyone is welcome to donate a curiosity to the library. The museum also has a Scholars in Residence program. 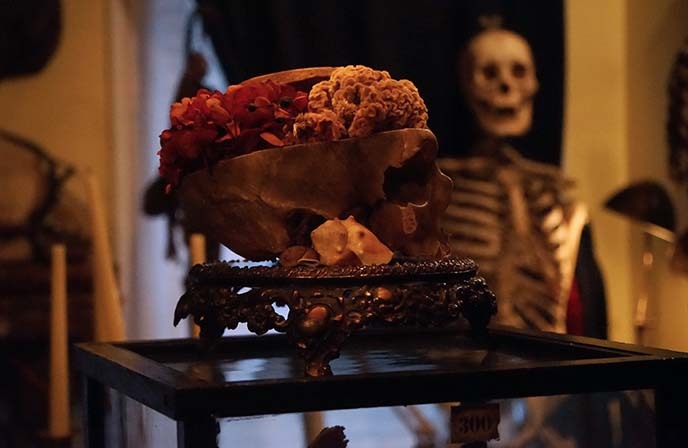 Currently, the posts are held by Evan Michelson of Obscura Antiques and Oddities, and writer Salvador Olguín who specializes in death in Mexico. 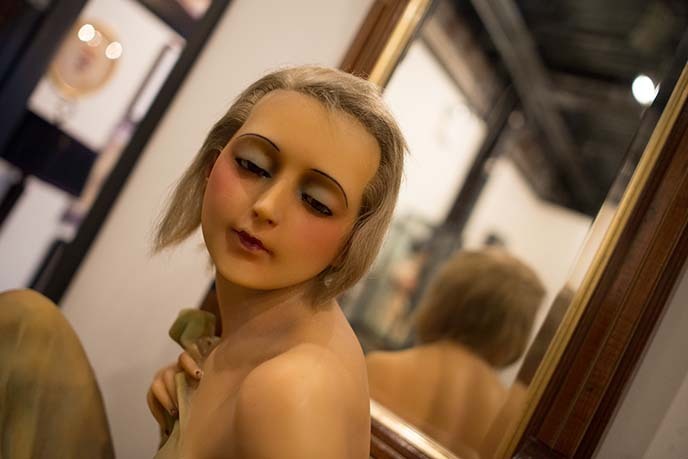 We chatted with curator Spencer, who spoke with passion about the waxworks on display. You can tell that we’re hanging on to his every word, as he describes the eerie history of the Berlin Panopticum! We felt like we were descending into uncanny valley, as we examined these life-like bodies. 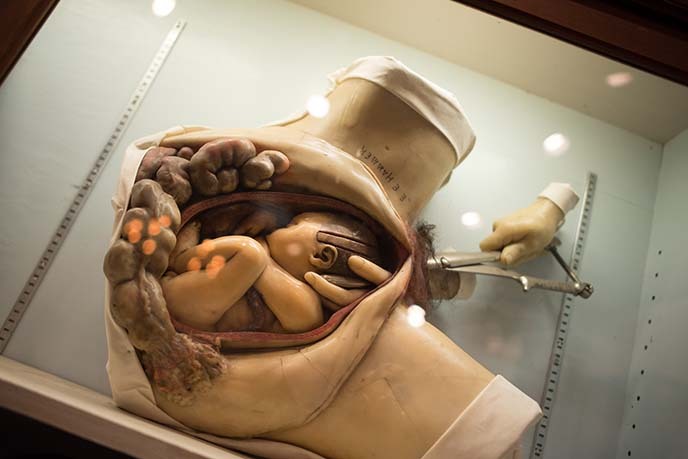 Some had exposed organs and fake hair, with fetuses peering out. Talk about a cabinet of curiosities! 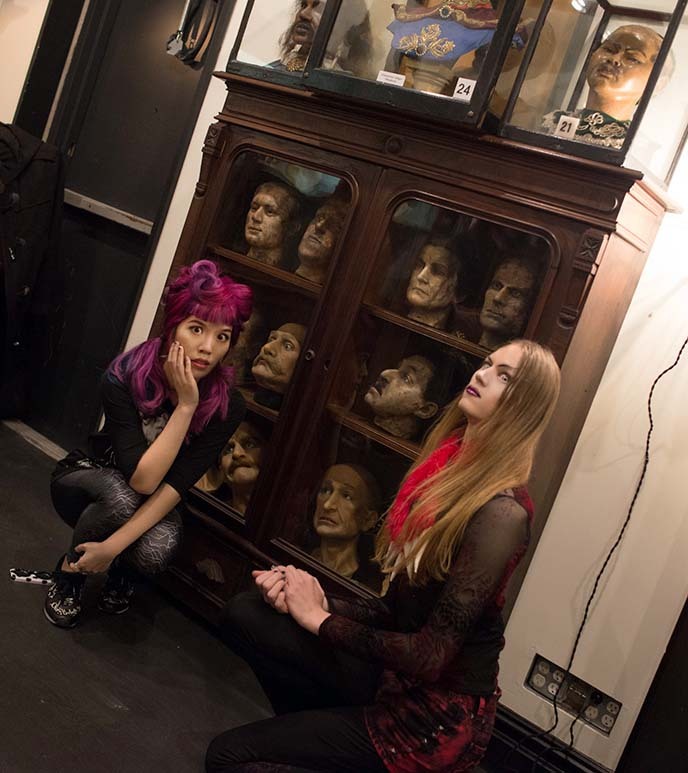 We’re posing with a case of death masks, featuring murderers and celebrities. Some of the artifacts were graphic, and you might feel disturbed by what you see. 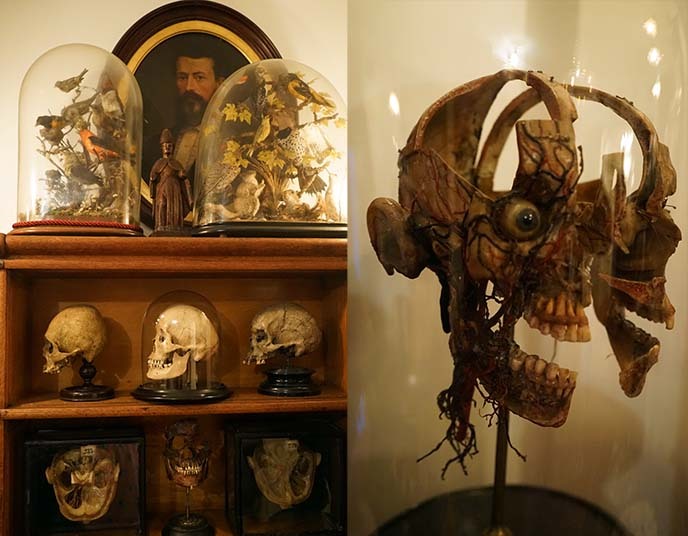 However, my friends and I adore collections like this one (the Mutter medical museum in Philly is another must-visit). These anatomical waxes are a fascinating part of our history, and a forgotten method of sharing findings. These objects were originally meant to be private medical tools, but now we can look at them with a critical and even artistic eye. We could have spent hours in the next room, a treasure trove of bizarre objects. 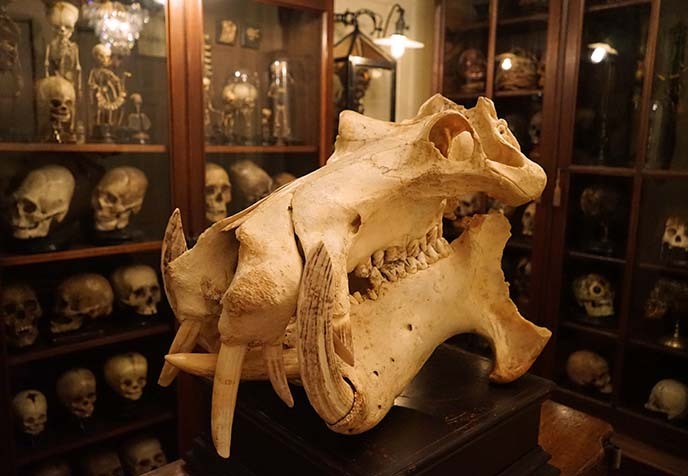 Founded in 2008, The Morbid Anatomy Library contains thousands of books, ephemera, creepy art and other rarities. This counter sums up what you’ll find here: dentures, religious candles, Day of the Dead skeletons, and a shrine to a Goth Emo boy! Visitors are encouraged to pick up the objects. We couldn’t resist doing a tribute to “see, speak and hear no evil.” Jenny is holding strips of teeth, and I’m listening to a gorilla footprint. Inspector Yukiro is on the hunt! The room is full of clues about how cultures worldwide represent death and the supernatural. 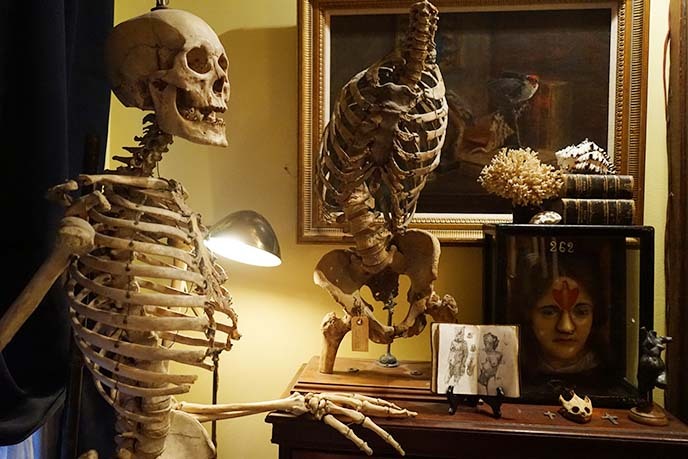 For those of you with a dark disposition, Brooklyn’s Morbid Anatomy Museum cannot be missed. On their site, you’ll find announcements for upcoming openings and lectures. 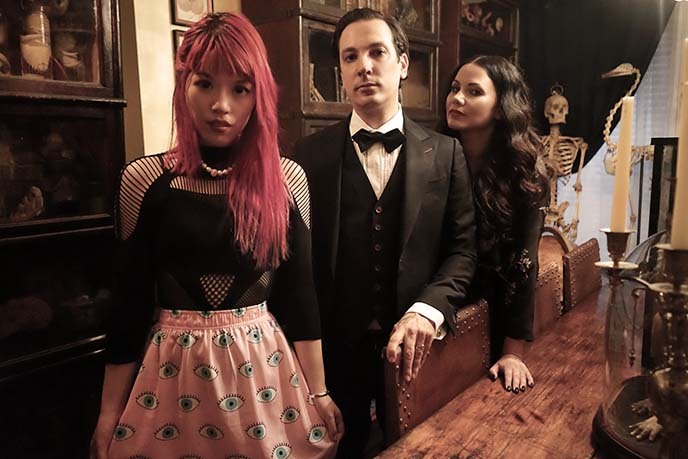 PS: for more New York alt-travel suggestions — including clubs, clothing stores and restaurants — check out my NYC Gothic guides here.